Gas Flaring In Nigeria: A Story For The Gods? Gas flares emphasise the aphorism that Nigeria is rich in energy resources but poor in energy supply. The Associated Gas Re-Injection Act was made as an Act to compel every company producing oil and gas in Nigeria to submit preliminary programmes for gas re-injection and detailed plans for implementation of gas re-injection. It made it illegal after the set date to flare gas without the permission of the Minister of Petroleum. It set a deadline of January 1, 1984 for the stoppage of gas flares. The target to stop gas flares moved from 1984 to 2008 and 2011. But gas is still being flared up to date. In a Paper presented by the Group Managing Director Oilserv Ltd, Mr Emeka Okwuosa – “Natural Gas Development in Nigeria” at the Petroleum Technology Association of Nigeria’s Forum in Houston Texas 2015, Nigeria flares about 1.2billion cubic feet (bcf/d) of gas a day, which could fuel about; 7000MW of efficient thermal electric power, over 1,400 agro-processing facilities, 350 textile plants, 70 fertilizer plants with opportunities for creating over one million jobs. This amount of gas flare represents 12.5% of all globally flared gas, which is 68% of the associated gas produced or 51% of the total gas production. According to the African Energy Outlook for 2014, as at 2012, Nigeria flared about 17bcm on the average, slightly more than its annual consumption. However, gas flaring in other West African producing countries has remained around 12bcm per year. In 2014, Nigeria lost about $1billion as oil companies operating in the country flared a large proportion of the gas produced from January to September 2014. According to data from the NNPC, about 295 billion standard cubic feet of natural gas was flared in the nine-month period. International oil companies and indigenous players burnt a total of 43.7billion scf in January, 50.1 billion scf in February and 38.3 billion scf in March. In April, 22.3 billion scf of gas was flared; 19.7 billion scf in May and 23 billion scf was wasted in June. In July, 29.1 billion scf was flared; 39.1 billion scf in August; 29.5 billion in September; and 44.37 billion in November. In December 2014, Nigeria lost $133.716 million, about N26.743 billion to gas flaring as oil and gas companies in the country flared 20.11 per cent of their total gas production. This is according to the NNPC’s Monthly Petroleum Information for December 2014. Specifically, the oil and gas companies produced 221.634 billion scf of gas, utilised 183.78 billion scf and flared 44.573 billion scf. The Nigerian Gas Company (NGC) put the average price of gas at $3 per unit of 1,000 scf, translating, therefore, to $133.716 million (N26.743 billion) for 44.573 billion scf flared, and $551.346 million (N110.27 billion) for 183.783 billion scf utilised. If 1.2 billion scf flared per day has the potential to generate up to 7000MW of electricity, the aggregate gas flared for 2014; about 376.41billion scf can translate into 21.97GW, in addition to its inputs in agro processing, textile plants, fertiliser plants, and the number of jobs created from the multiplier effect. 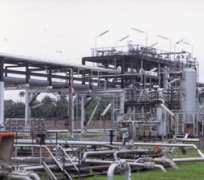 The Minister issued a directive which was signed on 15 August 2011 increasing the gas penalty fee from N10.00 to $3.50. However, the oil companies have failed to comply with the directive and have continued to flare gas without compliance with the new rate as communicated in the Ministers directive. Using the DPR gas flare information (irrespective of the inherent errors arising per the factors earlier stated) to compute the potential revenues for the relevant years at the rate of $3.50 per scf is $4.1billion versus the $177million computed by the DPR using the N10 per scf. Despite the penalties, the operators have continued to flare gas at the rate of N10 per scf and records at the Department of Petroleum Resource (DPR) reveal that none of the companies paid any gas penalty fee in 2012 and the DPR seem to look away; possibly for reasons best put as questions like; has the Nigerian government so far failed to pay its quota in the expected sums of gas penalties given that most of the oil and gas projects are run as joint ventures? Is it cheaper to flare gasses than monetise gas or reinjection them considering the lack of infrastructure? If the affirmative is the response, then it’s possible that the practice of gas flaring without payments of penalties may remain longer than needed especially when alternative arrangements that ensure the working of both the IOCs and the Nigerian government via NNPC; NLNG and NGC are not put in place. Every year, around 140 billion cubic meters of natural gas produced together with oil is wastefully burnt or flared at thousands of oil fields around the world. This results in more than 300 million tons of carbon dioxide being emitted into the atmosphere – equivalent to emissions from approximately 77 million cars. The emissions from gas flaring contain smoke, soot, smog and other acidic particles which constitute serious health hazards mostly in the form of respiratory track diseases. The presence of carbon and traces of nitrogen and sulfur in natural gas leads to the production of various oxides and sulphides. When these chemicals are inhaled through flaring, it settles in nostrils down to the lungs as thick carbon monoxide, which blocks the passage of oxygenated blood to the heart of human beings and animals. The oxides and sulfides in hydro-carbon with gaseous chemicals when flared combine with water in the atmosphere to form various types of corrosive acids such as nitric and sulfurous acids that irritates the human skin and prevent plants chlorophyll from functioning. This also leads to cancer of the skin and corrodes galvanized roofing sheets around oil and gas production zones. Other environmental hazards associated with gas flaring include; increased environmental temperature, heat-wave and global warming. These environmentally degrading conditions dehydrate surroundings, habitats, eco-system, food chains, nitrogen cycle, oxygen cycle, flora and fauna, animals and vegetations and thereby cause their actual deaths or poor yields of environmental resources. Gaseous acids like cadmium, benzene and calcium also pollutes streams, natural water ways like swamps, creeks, ponds, including arable farm lands, rivers, soil nutrients and thereby kill fishes, aquatic animals and plants and starve human beings of sources of clean water. The re-injection of natural gas would also be harmful, if the injected gas escapes to the earth surface and when it ignites, the result is wild fire and pollution, including destruction of lives and property; seismic activities lead to permanent damage of farmlands and buildings. In the current global food shortage, rising water levels, floods, erosion, rising warm temperatures and other adverse effects. Government in consultation with industry stakeholders should fix a definite time frame to end flaring of associated gas and fully implement the Gas Re-injection Act. While the government lead the way by honouring joint venture commitments in the form of paying their portion of the penalties, so as to have the moral-standi to ask IOCs to pay theirs; after-all the marginal differences comes back to the government of Nigeria in the form of revenue. In accordance with the recommendations of the Ribadu Committee Report, DPR should independently track and record gas production and sales data. The DPR should develop a proper process to independently track and record gas flare figures. This would ensure that there are no losses of revenues due to the Federation Account. It would also provide the important data necessary for reservoir management. Disclaimer: "The views/contents expressed in this article are the sole responsibility of Ofoegbu Donald Ikenna and do not necessarily reflect those of The Nigerian Voice. The Nigerian Voice will not be responsible or liable for any inaccurate or incorrect statements contained in this article."